C-Line Self-Adhesive Attaching strips are heavy-duty strips that will allow addition odd-sized materials to any standard three-ring binder. The adhesive permanent bond is strong and simple to apply on any materials. Materials are now capable to be inserted into a three-ring binder without having to be hole punched. Look nowhere else, C-Line has all your attaching solutions! Insert Size: 11 x 1"
Transcript: Welcome to MyBinding.com. These are the 11x1" Self-Adhesive Attaching Strips from C-Line. For oddly sized items or materials that can’t be punched, these 3-hole punched self-adhesive strips will keep those items secured in your binder. These strips are 11” long to cover the length of a standard sheet of paper, and 1” wide to give enough grip to the material you want to secure. The release liner comes off in two pieces to give you a guide for precise attachment. Even use them to reinforce punched holes so they won’t tear out on binder rings. Welcome to MyBinding.com. 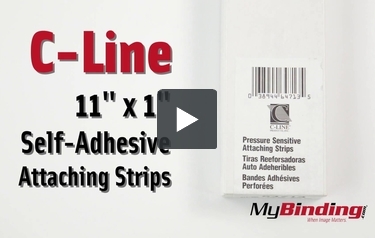 These are the 11x1" Self-Adhesive Attaching Strips from C-Line.